This entry was posted on December 21, 2017 by Zoe Thomas. 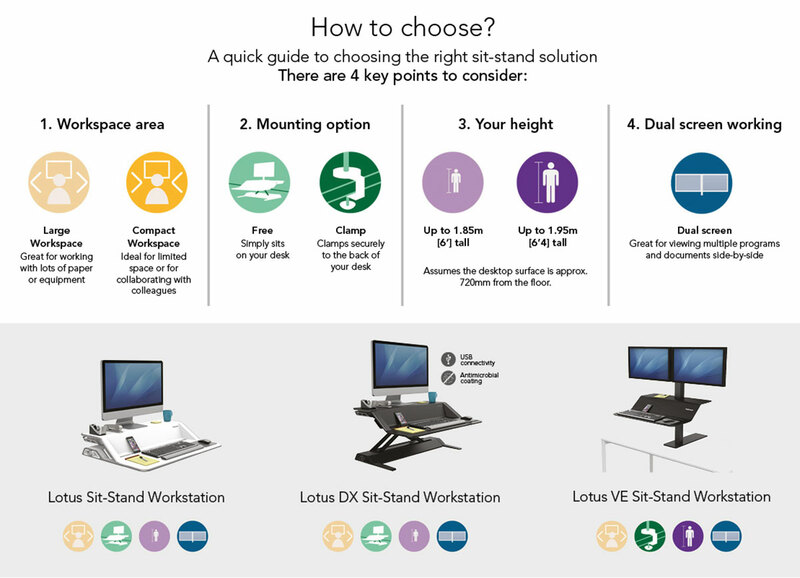 The three new Lotus Sit-Stand Workstations from Fellowes offer simple yet clever technology to keep your body healthy and your workstation neat, sleek and ergonomic. So what's it like to use the Lotus range? In a word: easy. When you're a busy person with targets and deadlines to meet, easy is exactly what you need. All Lotus models come in both black and white. Your Lotus Sit-Stand Workstation or Lotus DX will arrive fully assembled. Simply pop your desk straight out of the box and onto your existing surface with zero hassle. No allen keys required, no faffing around with instructions. You'll be typing while standing like a boss in no time. With the Lotus VE, it's easy enough to clamp the pre-assembled workstation to the back of any surface within seconds. To explore all 22 height settings, just press the levers on each side of the platform - not forgetting to take a moment to appreciate the gliding sensation of the patent-pending Smooth Lift Technology. Even with all your equipment on top, lifting the surface is no bother. To find the right height, make sure that when you place your hands on the keyboard, your forearms rest at a right angle to your body. If space is tight you don't need to worry - unlike some other sit-stand platforms on the market, all three lotus models extend upwards within their own footprint, as opposed to up and out. Fellowes' unique cable management system allows you to easily feed wires around the back of your desk to keep your wires in good condition, and your desk neat and tidy. A tidy desk is one of the pillars of good ergonomics, as it potentially reduces reaching and twisting. For organisations wondering how sit-stand desks could save them money in the long run, simply input a few details into Fellowes' ROI calculator. 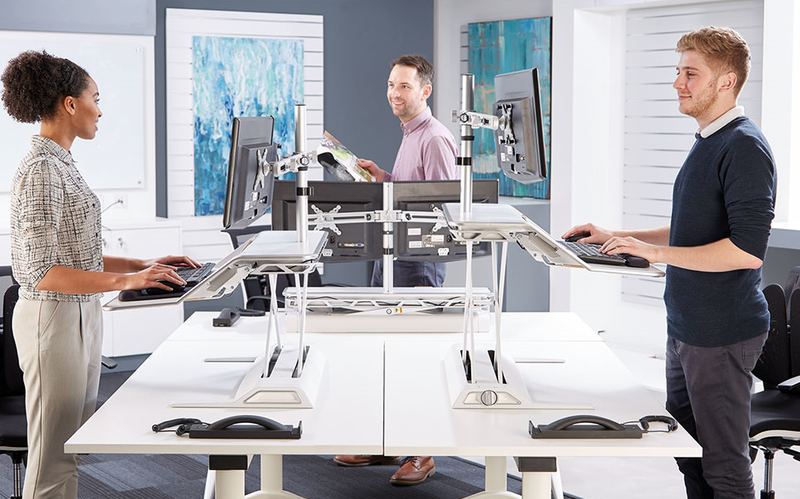 Buy your Lotus Sit-Stand Workstation now, or browse our full collection of sit-stand desks and height adjustable platforms.